3 Words that best describe you: Kind, calm, lighthearted. Who is your mentor: My parents. What are your future aspirations for Decathlon: Compete at the Olympic Games. What is your favourite pre-competition meal: Home cooked chicken with quinoa and broccoli (the night before). Most interesting place you have competed: U.S Olympic Training Center in Chula Vista, San Diego. Additional Sports Played: Soccer, basketball, golf, snowboarding. Hobbies (other than sport): Reading, watching TV, following sports (mostly NBA and EPL). Favourite Professional Athlete or Sport Hero: Hard to single just one athlete out, since I look up to many athletes for various reasons. Favourite Movie or TV show: I can’t decide! Sport Career Highlight: Winning Nationals and Placing 2nd in the Pan Am Cup. If I didn’t play sport, I would be: No idea. 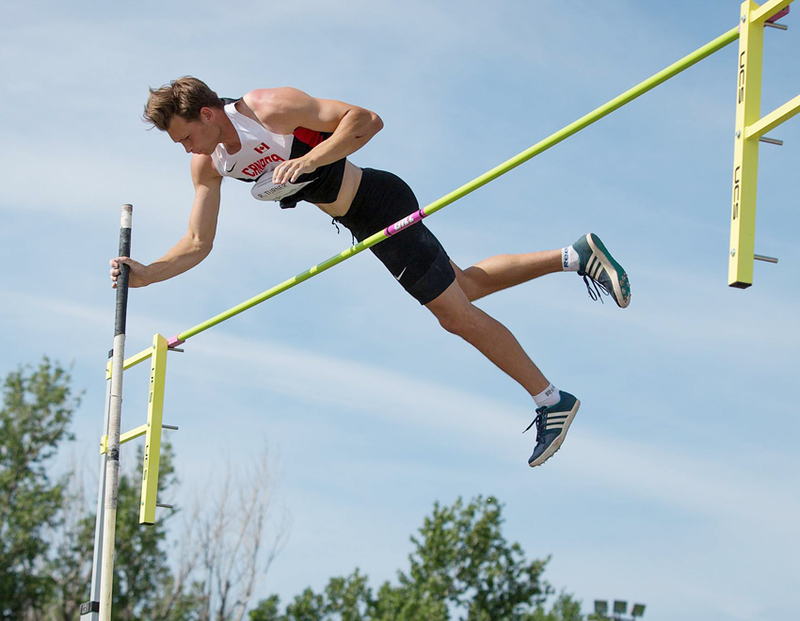 Tell us about your Canadian Combined Events Gold and PanAm Cup Silver in Ottawa Jun 17-19? after the first day, 3rd amongst the Canadians. The next day things got interesting after the pole vault when a few of the top guys didn’t make a height, which put me right in the mix for a spot on the podium. Going into the last event (1500m) I was sitting in 4th place, 2nd in Canada, and I knew I had to run fast to get on the podium. I ended up winning the 1500m in a 10s PB, and bumped myself into 2nd spot in the Pan Am Cup, and 1st in the Nation. I couldn’t have done it without the support of my coach Pat, as well as my coaches from Toronto and my brother. Even after he got injured on the first day, James stuck around and guided me through the rest of the events by giving me technical and strategic advice. I will be training in Kelowna with the Okanagan Athletics Club and Coach Pat Sima-Ledding and plan on competing at the Jack Brow (Kelowna, July 1st-3rd), Canadian Senior Nationals (Edmonton, July 7th-10th), and the NACAC u23 Championships (El Salvador, July 13-18th). After that I’ll be taking some time off, hopefully play some golf and go on some fun trips/adventures!